Fire crews were sent to the Royal Sussex County Hospital this evening after a fire broke out in a basement. East Sussex Fire and Rescue Service was called to the fire in a cleaning room in a basement at 6.22pm and sent six fire engines and the aerial platform. By 7.40pm, the flames were out. It’s thought the fire was caused by an electrical fault. The fire service said there had been a partial evacuation, but a spokesman for the Brighton and Sussex University Hospitals NHS Trust (BSUH) said he understood nobody had been evacuated. No patients were involved. A fire service spokesman said: “We were called at 6.22pm this evening by an automated fire alarm. “We sent six appliances and the aerial ladder platform which is standard attendance for this kind of callout. “There was a fire in the basement and we had two firefighters in breathing apparatus deal with it and then ventilated the area. 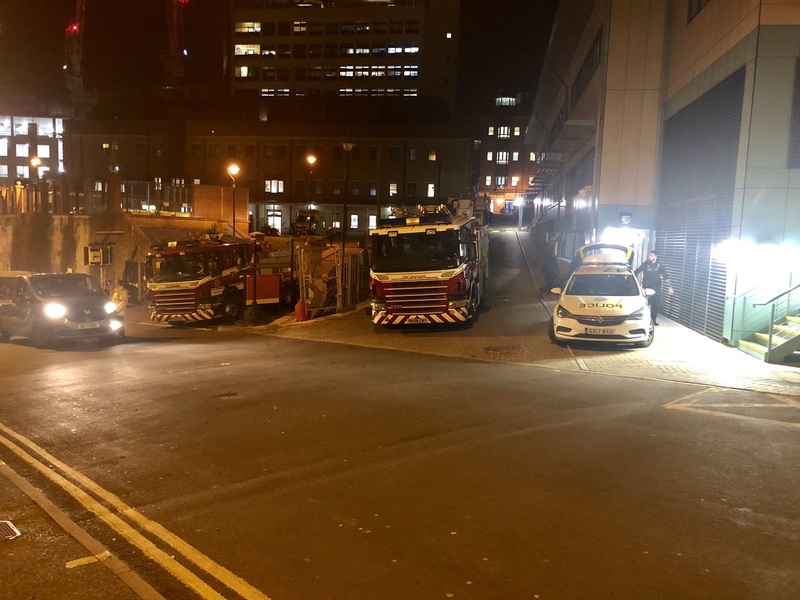 A spokesman for BSUH said: “There was a small fire in one of the cleaning rooms in a basement near the car park on Level 4.